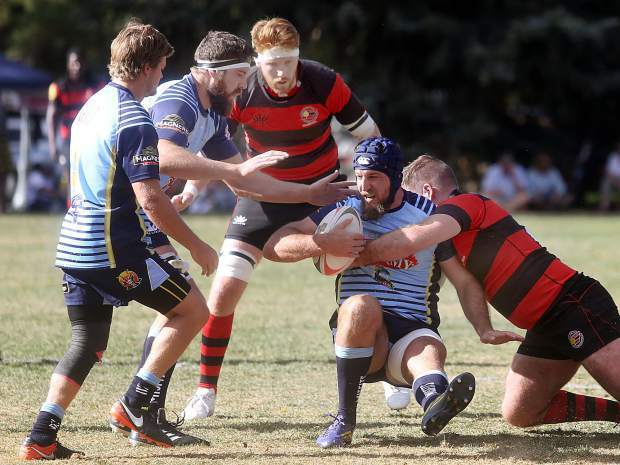 The Gentlemen of Aspen Rugby Football Club plays the Dark 'n Stormy Misfits in the Aspen Ruggerfest final on Sunday, Sept. 16, 2018, at Wagner Park. 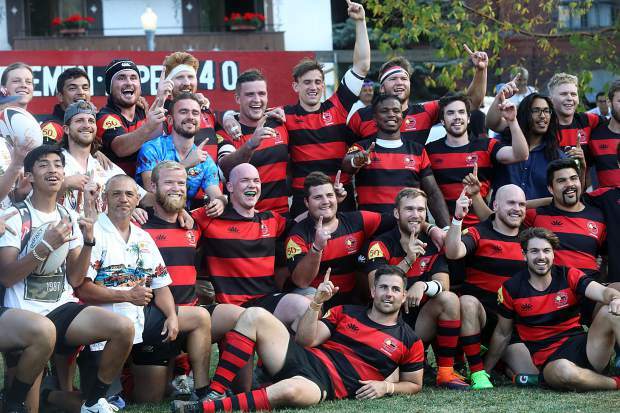 The Gents won, 40-38, for their first Ruggerfest title since 2015. (Photo by Austin Colbert/The Aspen Times). 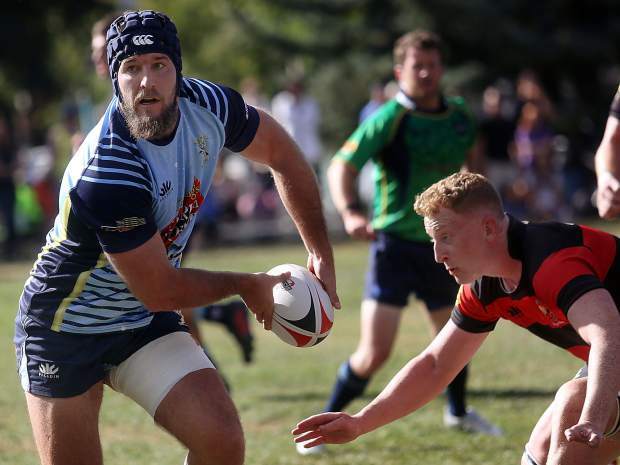 The Gentlemen of Aspen Rugby Football Club beat the Dark 'n Stormy Misfits in the Aspen Ruggerfest final, 40-38, for their first Ruggerfest title since 2015. (Photo by Austin Colbert/The Aspen Times). 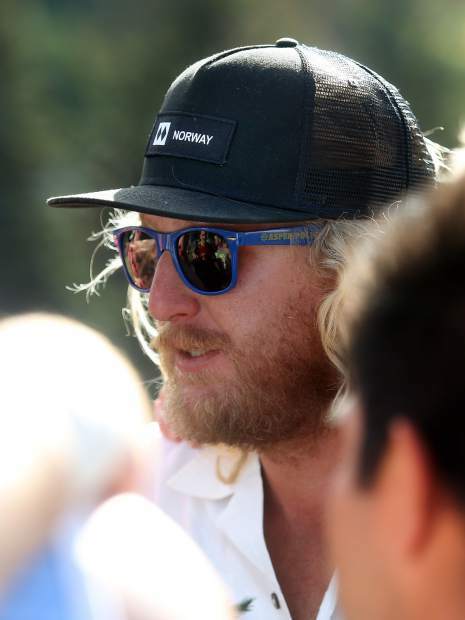 Gentlemen of Aspen Rugby Football Club coach Will Herborn talks to the players ahead of their match against the Dark 'n Stormy Misfits in the Aspen Ruggerfest final on Sunday, Sept. 16, 2018, at Wagner Park. 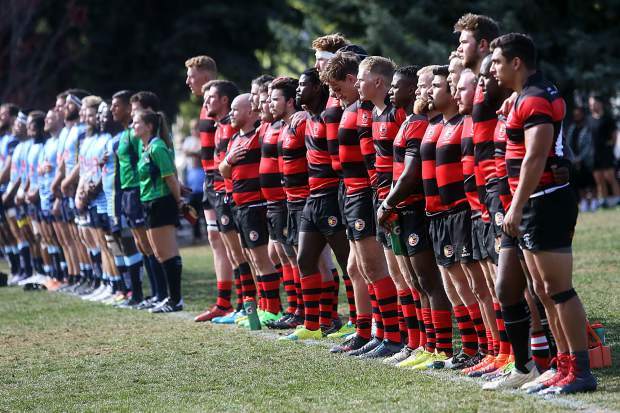 The Gents won, 40-38, for their first Ruggerfest title since 2015. (Photo by Austin Colbert/The Aspen Times). 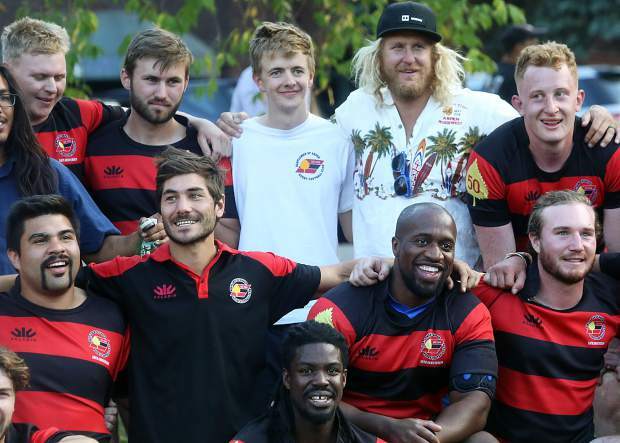 The Gentlemen of Aspen Rugby Football Club celebrate with the trophy after beating the Dark 'n Stormy Misfits in the Aspen Ruggerfest final, 40-38, on Sunday, Sept. 16, 2018 for their first Ruggerfest title since 2015. (Photo by Austin Colbert/The Aspen Times). 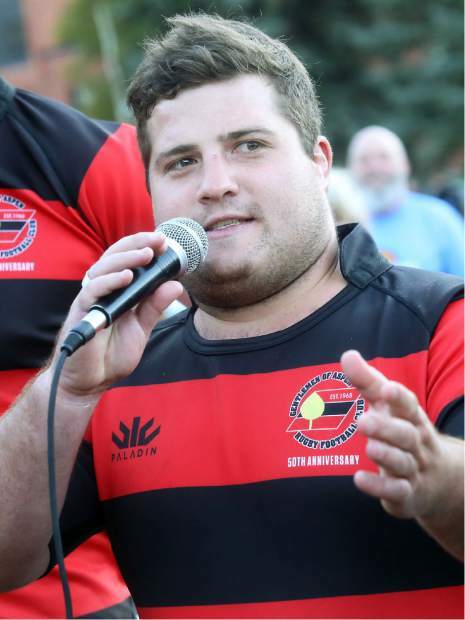 The Gentlemen of Aspen Rugby Football Club's Darren Barth gives thanks after beating the Dark 'n Stormy Misfits in the Aspen Ruggerfest final, 40-38, for their first Ruggerfest title since 2015. (Photo by Austin Colbert/The Aspen Times). 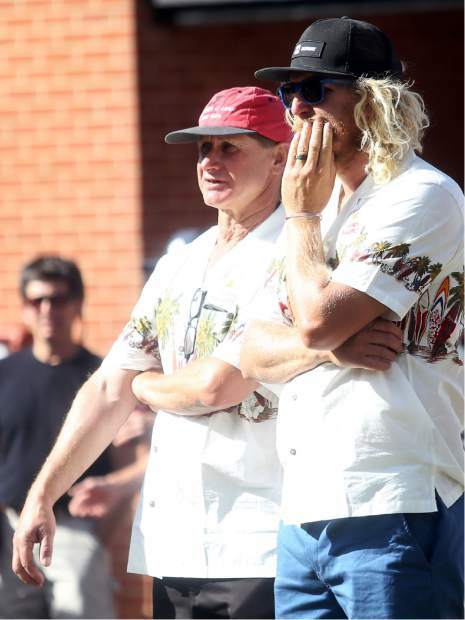 The Gentlemen of Aspen Rugby Football Club coaches Will Herborn, right, and Cameron McIntyre chat before playing the Dark 'n Stormy Misfits in the Aspen Ruggerfest final on Sunday, Sept. 16, 2018, at Wagner Park. 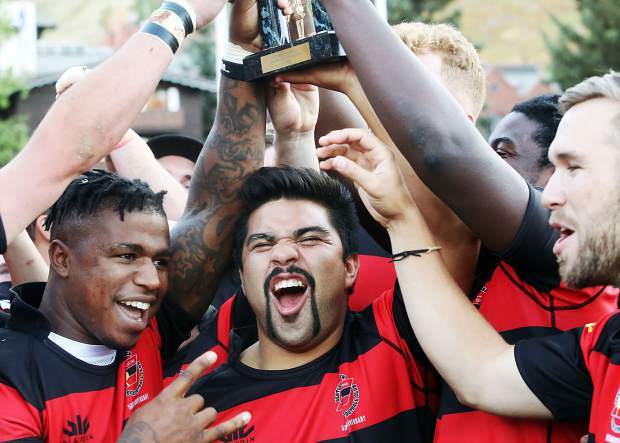 The Gents won, 40-38, for their first Ruggerfest title since 2015. (Photo by Austin Colbert/The Aspen Times). 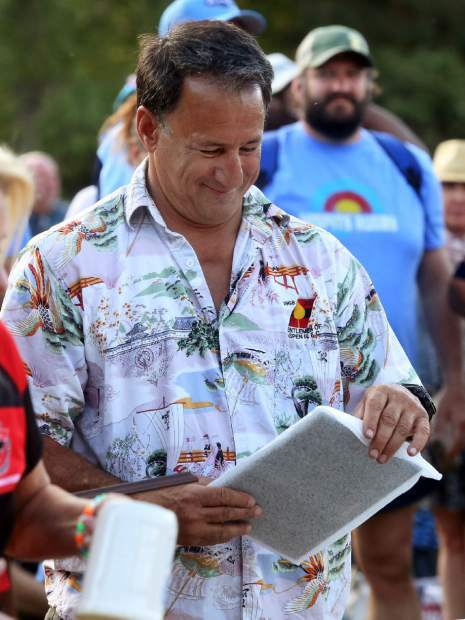 The Gentlemen of Aspen Rugby Football Club President Jerome Hatem helps set up for the awards after the club beat the Dark 'n Stormy Misfits in the Aspen Ruggerfest final, 40-38, for their first Ruggerfest title since 2015. (Photo by Austin Colbert/The Aspen Times). Aspen's Cori Lambert plays for the Kougars and Kittens women's rugby team against the Salt Lake City Sister Wives during the 51st annual Ruggerfest rugby tournament on Saturday, Sept. 15, 2018, at Wagner Park in Aspen. (Photo by Austin Colbert/The Aspen Times). 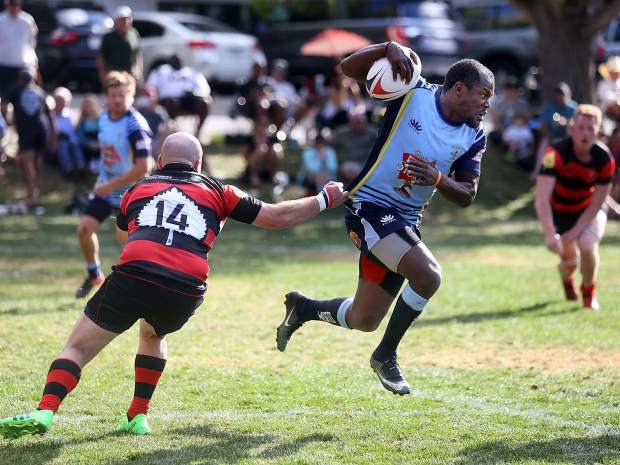 For the third straight year, it looked like the Gentlemen of Aspen Rugby Football Club was going to get run off its own pitch in the finals of the annual Ruggerfest tournament. 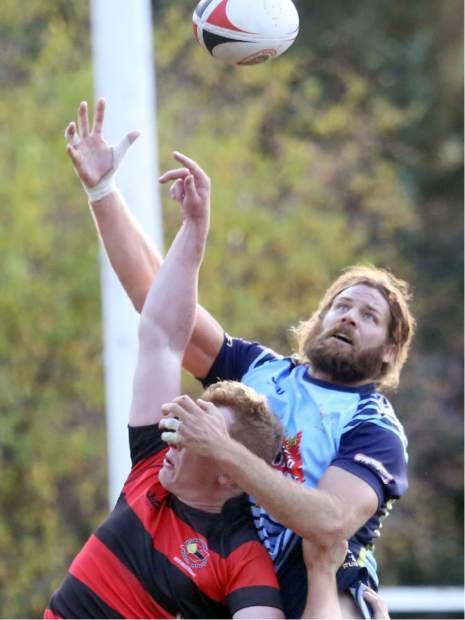 Instead, third-year coach Will Herborn and the Gents manned up to rally for a 40-38 win over the Dark ‘n Stormy Misfits on Sunday at Wagner Park in downtown Aspen, their first Ruggerfest title since 2015. 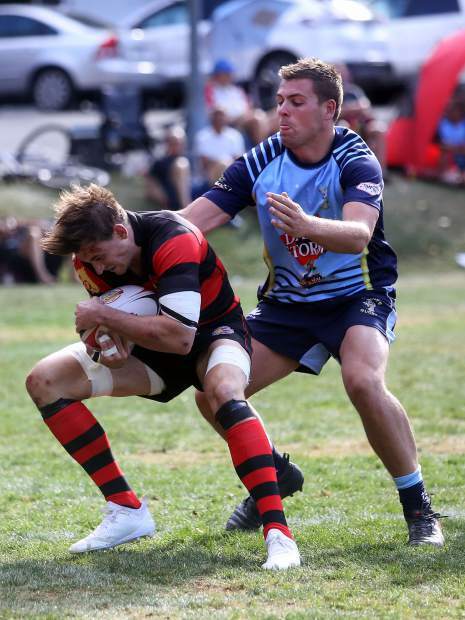 This was the fourth straight tournament the two teams had met in the finals at Ruggerfest, which was being held for the 51st year. 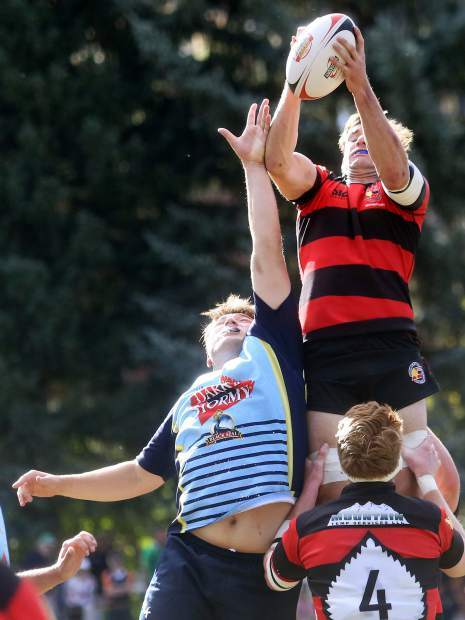 The last time Aspen won was three years ago, a 51-27 victory over the Dark ‘n Stormy Misfits. But the past two seasons, it was the Misfits winning in a rout: 47-20 in 2016 and 50-22 in 2017. With the Misfits leading 26-7 late in the first half in Sunday’s final, it looked like more of the same. 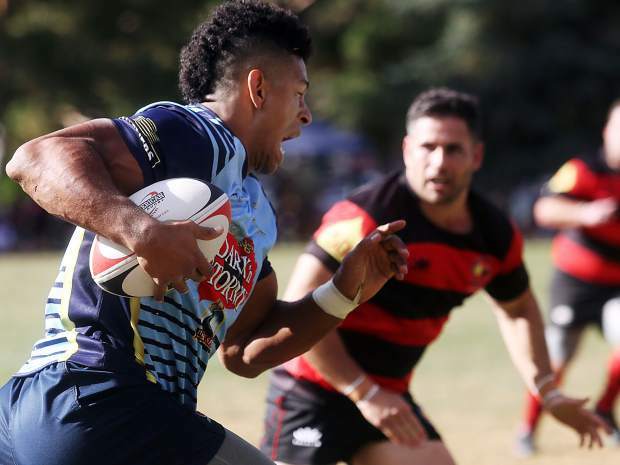 Aspen led the Misfits 7-0 after it was awarded a penalty try early in Sunday’s contest. But four straight tries later and Dark ‘n Stormy was on its way to a third straight championship. However, the Gents went into the half with a bit of momentum after scoring on a late try to trail only 26-14 at the midway point. The Gents came out in the second half and played a bit possessed. Two quick tries and the match was suddenly tied at 26, and not long after Aspen scored yet again to take a 33-26 lead. The advantage reached as much as 40-26 midway through the second half, a run of 33 unanswered points for the Gents. 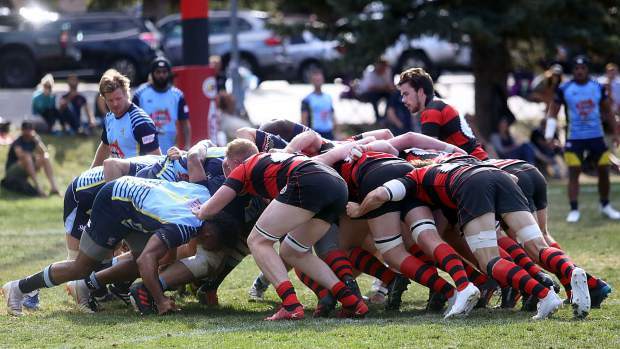 Dark ‘n Stormy did get two tries back, but a missed kick on the final conversion attempt left them two points short, and the Aspen defense was able to fight them off over the final few minutes to earn the win. En route to the championship, the Gents had to beat each of the Misfit teams entered into the open division. 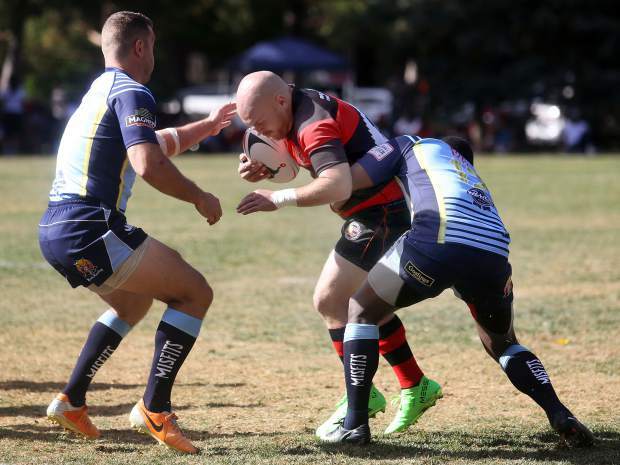 This included wins Saturday over the Denver Misfits and the Utah Misfits. Aspen finished the two-day tournament a perfect 4-0. The Salt Lake City Sister Wives wrapped up a dominant tournament Sunday by beating the Denver Black Ice in the women’s championship match, 43-12. The master’s (35 and up) division title went to the Dark ‘n Stormy Misfits over Time, 29-22. 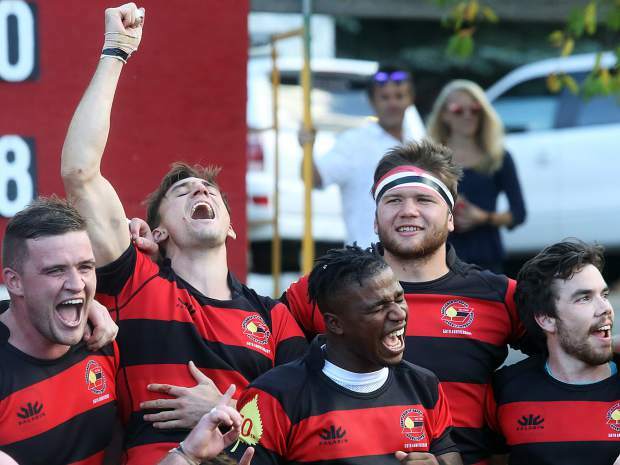 Olympic Rugby Club won the Old Boys 45s title, while the Cardinals won both the 50s and 55s titles.